It's compact, but holds plenty of line -- and it's destined to beat the tar out of your favorite inshore species, from trout and reds to blues and calicos. 5 CRBB super corrosion-resistant ball bearings; Infinite Anti-Reverse roller bearing. Rugged aluminum alloy frame and side-plate; light, quick, perforated machined-aluminum spool; stainless steel main shaft; exclusive 7-disc fiber-composite drag system. All this, plus the assurance of Daiwa's specialized Total Corrosion Protection package, for years of reliable service -- hard to beat at this price! "This is such a powerful reel. When I first got it, I took it bass fishing to break it in and hooked what I thought was a 2 pound bass. When I brought it in, it was over 5 pounds! 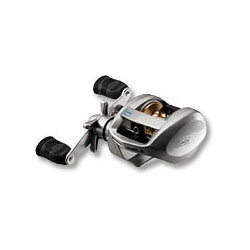 It is great for redfish and small tarpon especially." "Living in Delaware, and fishing mostly Tidal inter-coastal waterways can be very punishing on equipment--no matter what the cost....I found these reels after buying the last 2 Extreme Inshore leftovers in Hanover last year, and I have been greatly surprised as to their action, durability, and usefulness..."